IWC will update its Aquatimer collection with three new models that the Schaffhausen-based watchmaker will fully debut at the start of the 2016 SIHH on January 18th in Geneva. 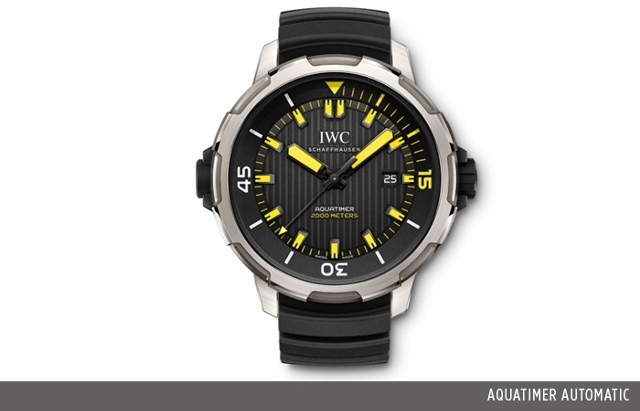 While not a full Aquatimer collection redesign, which IWC conducted in 2014, these 2016 additions tweak existing collections. The first is the Aquatimer Chronograph Edition La Cumbre Volcano, a 500-piece limited edition flyback chronograph dedicated to the La Cumbre volcano in the Galapagos Islands. The dive watch, water resistant to 300 meters, features the firm’s SafeDive system, which allows the wearer to advance an internal uni-directional bezel in one-minute steps by turning the external bezel. IWC notes that the Safe Dive system makes it much easier to set the dive-time bezel, even with cold hands or when wearing diving gloves. Inside is automatic IWC in-house Caliber 89365 (with vertical clutch) with a power reserve of 68 hours. The black dial has luminous hands, markers and internal rotating bezel and the watch arrives on a black rubber strap with steel pin buckle and the IWC bracelet quick-change system. Part of the proceeds from sales is used to support the Charles Darwin Foundation. 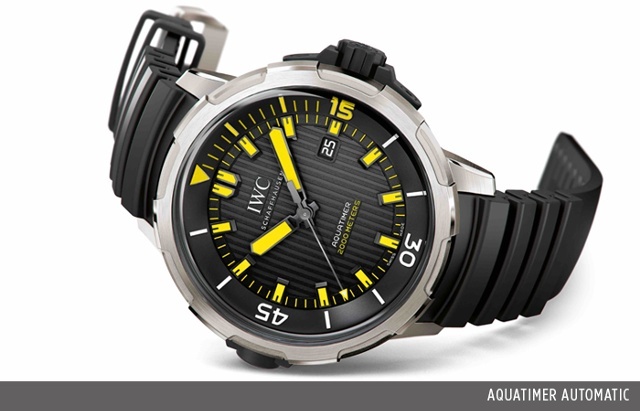 The second new Aquatimer is a 46mm titanium black and yellow version of the Aquatimer Automatic. IWC reminds us that this design originated in 1982 in a watch designed by Ferdinand A. Porsche for mine clearance divers. The Aquatimer automatic is a deep-dive model that is water resistant to an impressive 2,000 meters and powered by automatic in-house manufactured Caliber 80110 with a 44-hour power reserve. The watch also uses the SafeDive system noted above and adds extra luminescent elements. On the case back is an engraving of a deep-sea diver. 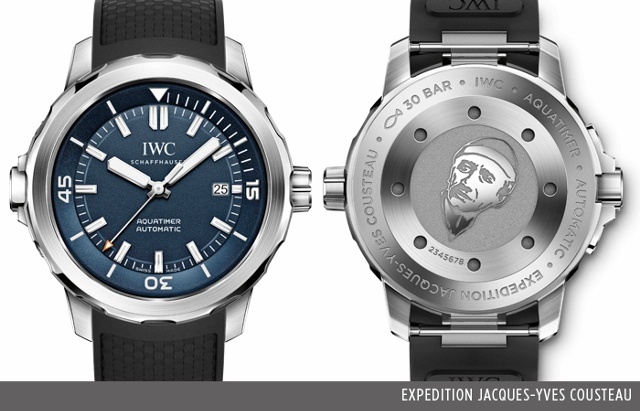 Finally, the Aquatimer Automatic Edition Expedition Jacques-Yves Cousteau is the latest special edition produced in honor of the French scuba-diving pioneer. 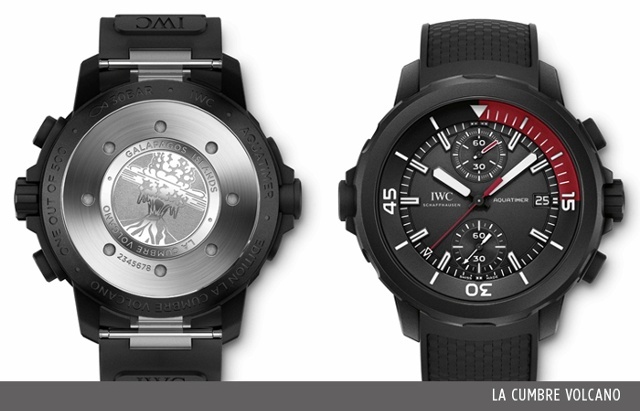 IWC is a long-time partner of the Cousteau Society and the watchmaker contributes to the restoration of Cousteau’s famous research vessel, the Calypso. This new watch offers a rich blue dial; its caseback shows Jacques-Yves Cousteau with his trademark beanie. The 42mm steel watch is water-resistant to 300 meters and is powered by automatic IWC caliber 30120 with a power reserve of 42 hours. Like the other new Aquatimers, this handsome piece also utilizes IWC’s SafeDive system, and it comes on black rubber strap with steel pin buckle and the IWC bracelet quick-change system. iW will cover all the IWC 2016 debuts, including all its new pilot watches, as the SIHH Begins in Geneva January 18th.